Are you wondering what your puppy's adorable antics will be like when they get bigger? Would you like a dog that is welcome anywhere? 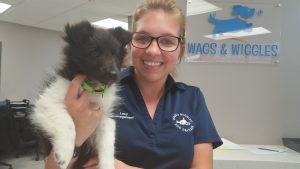 A perfectly behaved puppy starts with Puppy School at Wags & Wiggles. Good puppy habits will give you a reliable, obedient, friendly dog as an adult. Wags & Wiggles students now have to option to learn the same great curriculums through the Wags & Wiggles Online Dog Training Classroom. You will find that our dog training philosophy is easy to follow and very effective. Even if positive reinforcement training and clicker training is new to you, our instructors will guide you. After participating in any of our training programs, your puppy will be attentive to you! Our professional training facility is 7,000 square feet of indoor, air-conditioned, matted classroom. You and your dog will learn quickly in this clean, friendly environment. 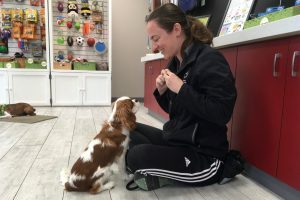 Whether you're looking for an all-inclusive Board & Train program, a group puppy socialization class, or something in between, we have what you need! Training should start the very same day you bring your puppy home. If you are new to puppy raising, then contact us now to schedule an immediate private in-home lesson. Group classes or other training programs at our facility can start once your puppy has been home for at least 7 days and has had a clean vet check. Read our blog post for common puppy training questions! You and your puppy are in expert hands! 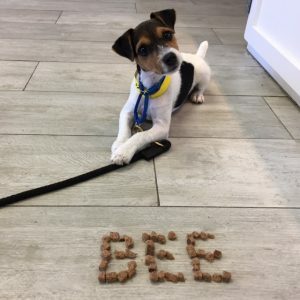 Which puppy program is right for me? What behavior/training would you like help with?